I first met my (second) cousin Fred at Easter 1971. I was just 18, about to sit my “A” Levels, when my Mum and I went on a “Golden Rail” holiday to Newquay in Cornwall. The whole point of the holiday was to meet our relative for the first time. We’d heard about this unconventional “black sheep” of the family through Fred’s Auntie May – a cousin of my mother’s who lived in Bournemouth. It was May who wrote regularly to both my mum and her sister Joan in Lytham St Annes, and as Fred and Joan had been “quite close” at one time, it was to Joan that she sent a cutting from a local newspaper about Fred in 1967. Two years after the short article was published (about Fred’s finger-painting on Brixham quay), Fred quit his teaching career at the age of 47 and moved to Cornwall to become a full-time artist. Now – this was a bold (and very risky) thing for anyone to do – and May’s opinion of Fred was somewhat akin to Captain Mainwaring’s view of Private Pike – “Stupid Boy!” Cornwall was full of artists – what on earth did he think he was playing at? Mum had heard about Fred, of course – and about his twin brother Arthur, who had been killed in the War – but could not remember ever having met him. 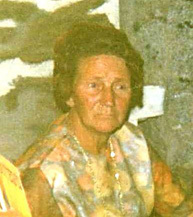 But he was still “family”, so she got his address from May and wrote to him at his cottage in Fowey. I don’t remember the exact circumstances about how we came to arrange it, but less than two years after Fred made his dramatic migration, we booked the holiday to Newquay (the nearest holiday place to Fowey that we could get to by train). It was a ten day trip (two of which would be occupied in the long rail journey from Lancashire), and I was very excited at the prospect of meeting this “black sheep” who had taken such a dramatic choice in his life. Here I was, about to leave education and set out into the real world – and now I was visiting a beautiful part of the country, and about to find out what it was that had influenced this strange relation of mine. The coastline at Newquay seemed absolutely wonderful to a teenager who had only ever experienced the relatively boring stretches of promenade and shingle of the Irish Sea and the North West. I was a keen photographer, and took plenty of shots of the towering cliffs and rocky shoreline. Fred was to come to our boarding house at 11am on the second day we were there, and I sat in the dining room window – eagerly looking forward to my first glimpse. Then up the path came this over-aged hippy, long hair (past his ears) and bushy beard, wearing a baggy fisherman’s jumper, blue jeans and heavy boots. 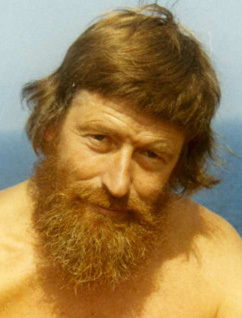 Fred Yates had arrived – and so had “Oxfam-chic”. Don’t get me wrong! This guy lived as he had to live – economically, and with incredible discipline on what was both practical and important. There were no frills with Fred. “Would you like to come over to Fowey?” he said. And of course the answer was yes. Fred was the perfect gentleman, and determined to be the perfect host. We went out to his car – a battered old Morris 1000 Traveller with flaking green paint and something like fungi growing out of the woodwork. Mum sat happily in the passenger seat while I climbed into the back – sharing my precarious perch with what looked like half the contents of a builder’s yard: bits of wood, pieces of canvas and cardboard, buckets, boxes, weatherproofs and other articles of clothing – and all of it rich in the smell of oil paint. I was in heaven! This was the beginning of a journey of discovery for me. Fowey was about 30 miles away, on the opposite coast. As we drove through the ever-changing countryside, sometimes rich and verdant green, sometimes austere with high stone walls, the conversation was infrequent. Fred was not a “chatty” type – and neither was mum. There were the usual pleasantries exchanged – “How was your train journey?” “Isn’t this a lovely part of the world?” “Is your hotel comfortable?” I was waiting for mum to ask the searching question “What made you decide to become an artist?” But it never came. Only years later I learned that this was a generation thing. Mum was too polite to come out with something so direct – those sort of questions were fine for journalists (and perhaps for close family), but not for the generation who had lived through the last war. As for me – I was still in awe, drinking in my surroundings, both inside the car and out. And then we reached Fowey. I’d been itching to say “Are we nearly there yet?” for the last 10 miles, but teenagers just don’t say that sort of thing. For those who have never been there, Fowey is quite a small place, almost hidden from view by the road until it suddenly dips into the valley, and you come across a cluster of buildings that appear to cling to the edge of the hillside before it plunges into the waters of the River Fowey itself. There was just one long, very narrow street, and Fred’s cottage was halfway along, but we had to drive past it before reaching a place to park. From the outside, I was disappointed. Along the journey I had seen all manner of quaint little cottages, built out of local stone, some with porches and little gardens full of colourful foliage – and I could imagine Fred to be living in one of those, possibly setting up his artist’s easel outside to paint a view of the river from his garden. It was nothing like that: we walked back up the narrow street, Fred towering above us with his broad, six foot three frame, and reached a row of terraced houses, all opening straight onto the street, faced with plaster and finished off in fading mustard yellow. But inside! Oh, what an Aladdin’s cave awaited me! The house was on three floors, linked by a spiral wooden staircase in the middle, and everywhere I looked I could see paintings. One corner seemed to have had a rack built to accommodate about 50 paintings on stretched canvas or hardboard, some even on cardboard. Every wall had been stripped of wallpaper and plaster back to the natural stone, and all the woodwork was original pine. The ground floor was stone, with just one small rug placed before an open fireplace. 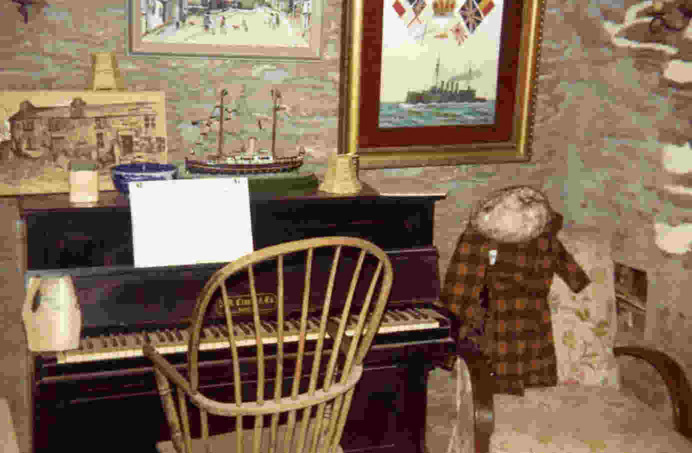 The furniture was simple, but pride of place was a small (ship’s) piano. Everywhere I looked, Fred had placed little items of bric-a-brac on shelves and ledges, and the whole image was homely and very, very cosy. There was a garden at the rear – but not like any other garden. This one started 18 inches outside the back door, straight off the kitchen, and then climbed up to over twice the height of the cottage itself! I climbed the narrow, twisting path past little terraces of all manner of rich foliage, vegetable patches, and simple excavations – and found the sort of spot I had only dreamed of. At the very top I could look right across the River Fowey, and even beyond. 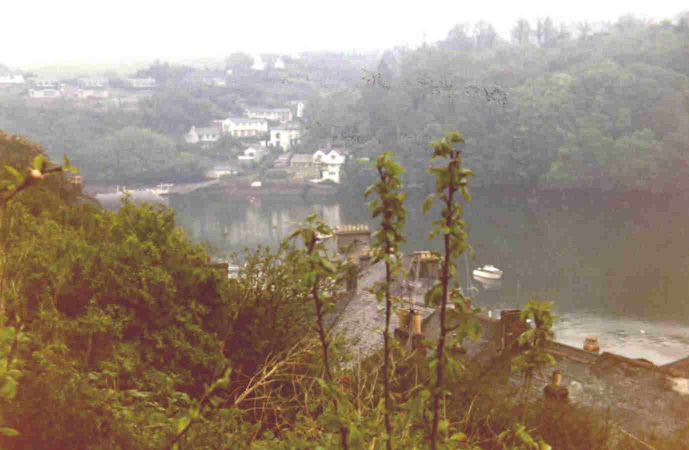 To the left was the Bodinnick car ferry, crossing the river past a building that (Fred told me) once belonged to Daphne Du Maurier. Looking to the right, the whole river opened out, and I could just see the smaller village of Polruan on the opposite side. Berthed right in front of me was a large ship, and dotted all over the estuary were hundreds of smaller craft. Now this was inspiration for an artist! And perhaps now, at last, I was beginning to understand what had made Fred take that fateful step into the unknown, just two years before.